Sometimes when my family visits Omaha’s world-class Henry Doorly Zoo and Aquarium, I wonder if even an elephant would be strong enough to pull us away. 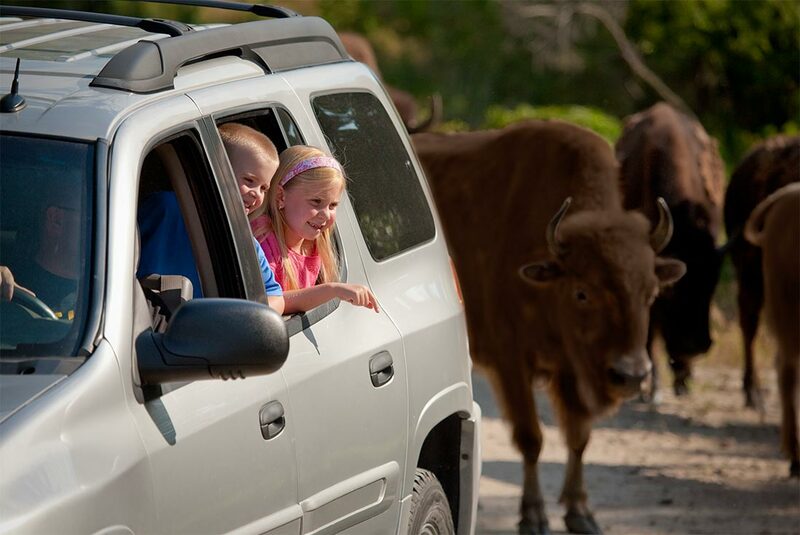 We visit Omaha often to see family, and my two kids have always loved visiting the animals. But thanks to a docent’s tip on our last visit there, we discovered perhaps the only thing that can get us to leave willingly: a drive-through zoo. And it was a short drive outside of Omaha to get there. 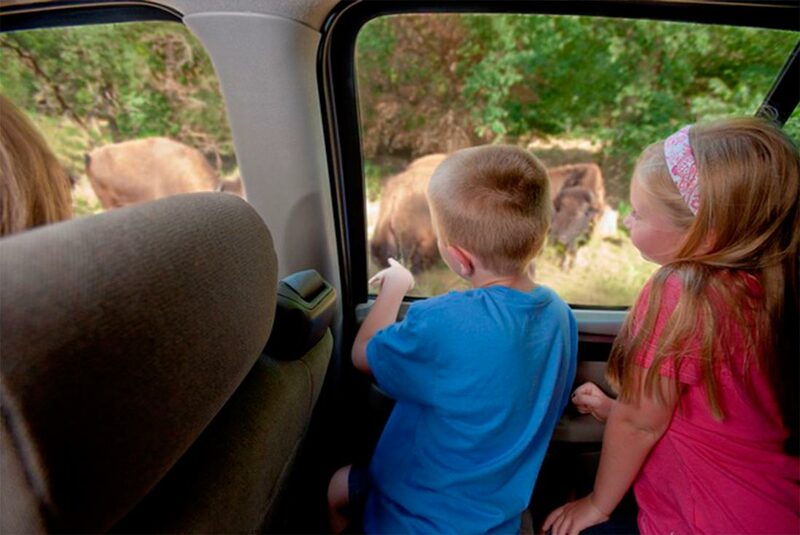 The docent had recommended spending a day at the Lee G. Simmons Conservation Park & Wildlife Safari, nestled among rolling hills 22 miles west of the zoo. My wife, Roberta, and I agreed that it sounded great and our two kids would love it. With one day of vacation left, we quickly made plans. Bison and wolves and bears, oh my! We arrived at the park on a Saturday morning. The sun was just beginning to warm the day, and wisps of mist were rising from the grassy fields at the entrance—enough to imagine we were about to explore some far-off savanna. We checked in at the visitor center and began driving the four-mile gravel road that meanders throughout the expansive park’s tour of North American wildlife. It wasn’t long before our first sighting. 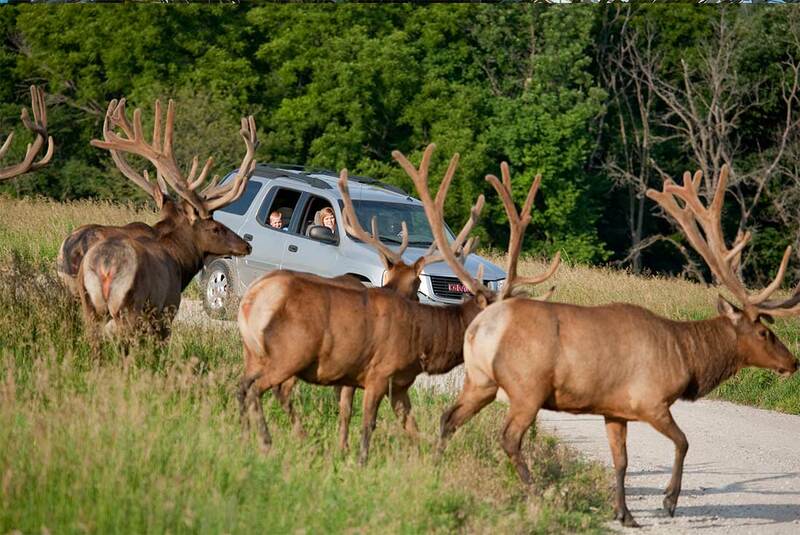 Benjamin jumped from his seat and popped his head out the sunroof to get a better look at a herd of American elk. We stopped at the road’s edge, right next to several bulls lazing in the grass. The largest was mere yards away—close enough to see the fuzz on his massive, velvet-covered antlers. During the fall mating season, we were told, visitors can hear these elk bugling. Next, we crossed Pawnee Creek and came to Pelican Wetlands, featuring nearly two-dozen white pelicans. Most came here following rehabilitation of wing injuries, including six rescued from the 2010 Gulf oil spill. The kids gushed over other sights and sounds they don’t experience back home: a frog croaking at the edge of a pond; seven turtles sunning themselves on a log, lined up in a single row like some sort of motionless conga dance; prairie dogs popping out of holes and chasing each other; a flock of chatty turkeys. Olivia, age 11, gobbled out her window. “I think one of them answered me!” she squealed. We reached the middle of the park and left our car to stretch our legs with a two-mile hike on easily navigated trails around Wolf Canyon. Benjamin and Olivia dashed ahead of us to the top of a hill, reaching an overlook. Though the bears live in a fenced-off canyon for safety, the multiple observation points gave us great opportunities to watch them. “A bear! A bear!” our kids shouted. They had spotted Cinnabuns, one of the park’s two American black bears. We joined the children and watched Cinnabuns sitting on the edge of a steep rock, balancing a turnip on the backside of one paw while crunching through it with forceful bites. Taking advantage of the access to knowledgeable keepers stationed all over the park, Olivia asked one what else the bears ate and then giggled when told they sometimes were given ice blocks filled with fish. Our family continued along the shaded, tree-covered path, coming to what Roberta most anticipated—a pack of grey wolves, who also dwell in a fenced-off canyon. We had the privilege of being at the park just as a distant town tested its monthly emergency siren. In response, Yazhi, the large, all-white alpha female, tossed her snout skyward and throated a deep, long howl in response. The rest of the pack joined in, creating a chorus of howls that echoed off the canyon walls. We hiked back to where we parked and the kids rushed to the Hands-On Corral, a petting zoo of sorts located at the trailhead. As chickens scurried around his legs, Benjamin tentatively approached a group of pygmy goats eating hay. A keeper handed Benjamin a brush and showed him how to run it through the goats’ coarse hair. 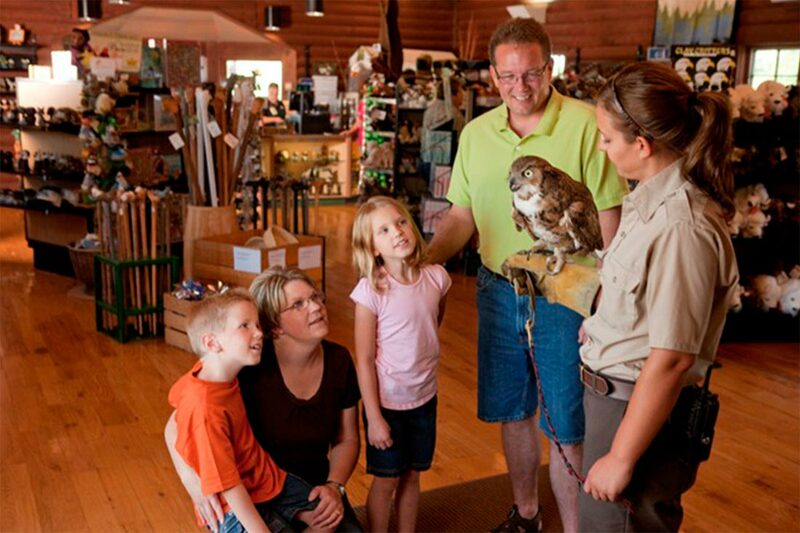 Owls and even bald eagles were highlights in the park’s aviary. Though the kids were reluctant to leave the animals, they were excited to see the rest of the park. We continued our safari drive through a marsh, seeing sandhill cranes, geese, ducks and trumpeter swans. From a distance, I spotted what I had most looked forward to: a herd of bison. The massive beasts were pawing at the grass, snorting. Some rolled on the ground, covering themselves in dust. Two bulls butted heads, parted ways, then went back to grazing. Our children stared open-mouthed, and I wondered aloud whether Lewis and Clark felt the same awe when they saw these kings of the Plains while crossing this very land two centuries ago. I drove even slower now as the bison disappeared in the rearview mirror, realizing from a glance at the map that we were approaching the park’s exit and visitor center. But before we had to leave, we had time for lunch at a picnic table. Our children chattered excitedly about what they had seen. Both had pored over the brochures we had picked up at the visitor center and were fascinated that some of the animals they had seen once were endangered species. Fortunately, their numbers are on the rise—thanks in part to sanctuaries like this. “I want to work at a zoo when I get older,” Olivia said with certainty. That alone was worth our trip. We talked of returning, perhaps for one of the park’s fall campouts with campfires, s’mores and a night sleeping under the stars. Benjamin and Olivia’s matching smiles told Roberta and me that it was a must-do. Reluctantly, we climbed into our car and headed for home. As we passed through the gates, Olivia leaned out her window, again, and gave a low, quiet howl. Benjamin followed her cue, then Roberta and me. We had discovered something strong enough to pull us back to Omaha and its wildlife safari again and again. 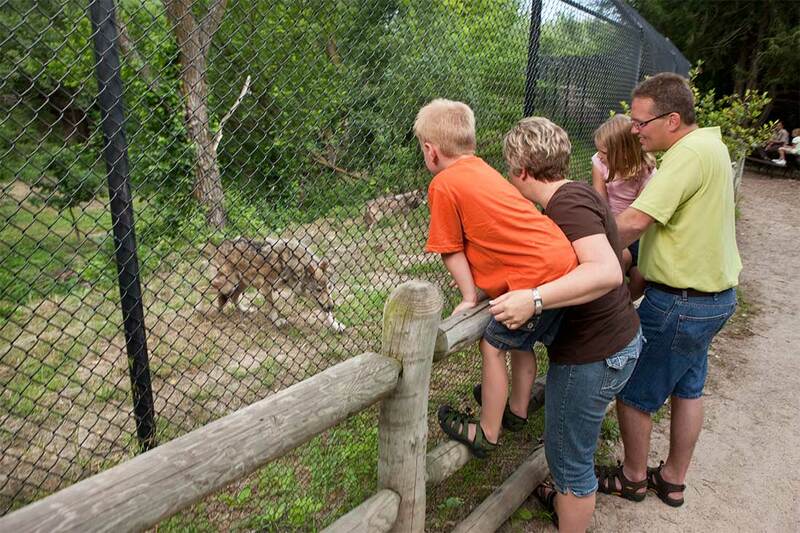 Download the Omaha Savings app to save $2 off admission for up to 6 people! Discover more day trips in Omaha.